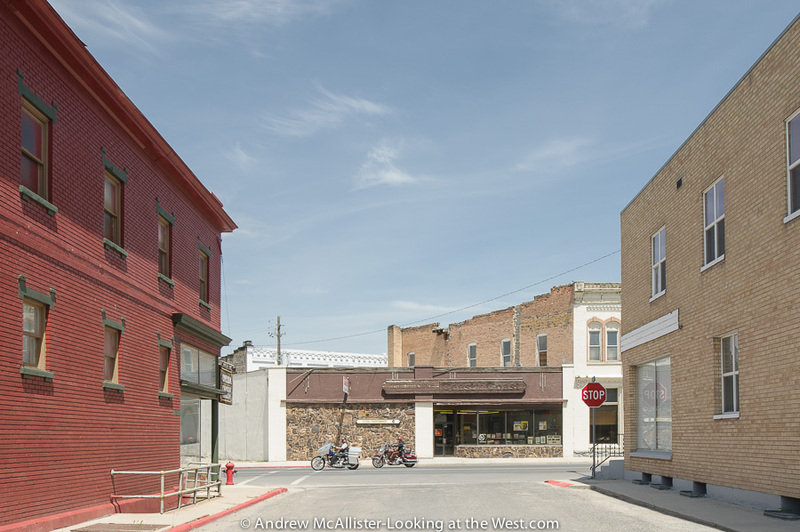 I took a walk around Downtown Brigham City earlier this year. It was the back of building that caught my eye this time. You get a different story when you walk the back alley. Old cars, a BBQ, TV antenna (who still uses those? 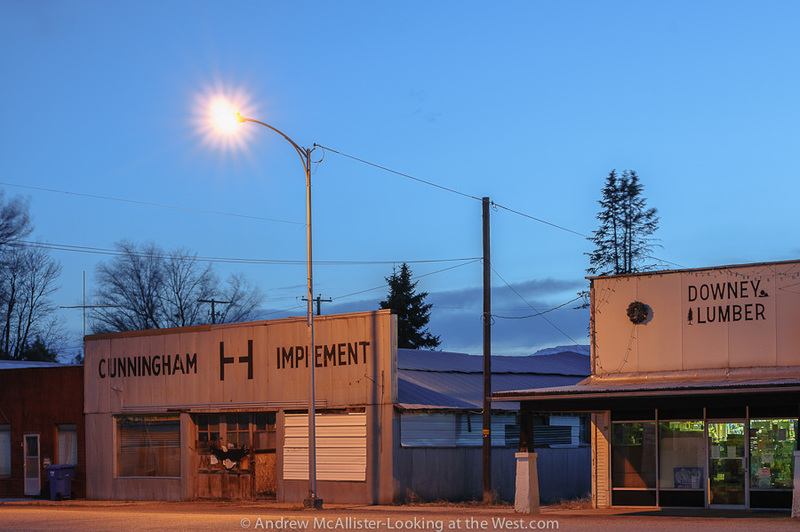 ), A really old building made of odd shaped rocks and with no windows, lots of wires and a new prefab temple and a carwash. Above: Someones Hideout, my favorite shot of the day. Photographed just before the leaves hid it for the summer. More wires. Above: More wires and shopping for boxes. A popular dumpster that had 3 visitors while I was photographing here none of whom seemed to notice me. 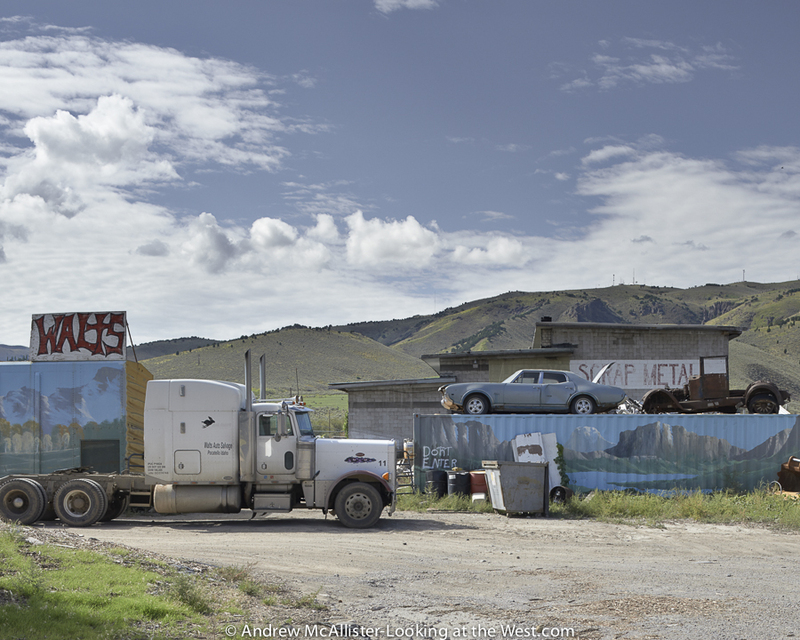 Above: The old general Store in Brigham city with 4.9 cent gas on a beautiful day. Above: A couple of barns with green sides and beige backs, a bag caught in the tree and a small dog watching me. Last stop, the Grain Silo. They sure keep this one clean and tidy. At first I was not sure about cropping the top of the silo head house but now I love the way it divides up the space. 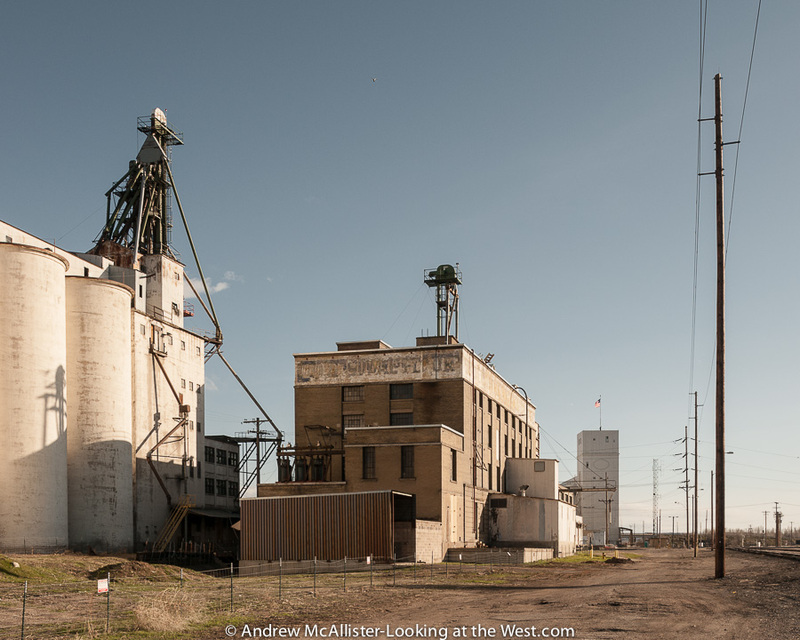 one more for my Grain Silo Survey project. 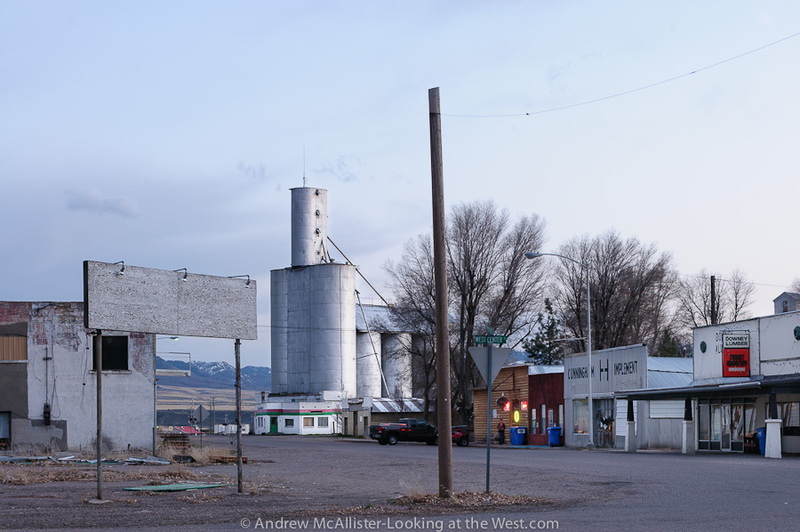 My exploration of the west is not that of a grand vacation or sponsored trek to some exotic location but one of many small trips to locations starting close to home and moving gradually farther away. It starts out with an idea for a photography project or a curiosity about a certain area. Following that I spend some quality time with a paper atlas and then some snooping around on google earth. 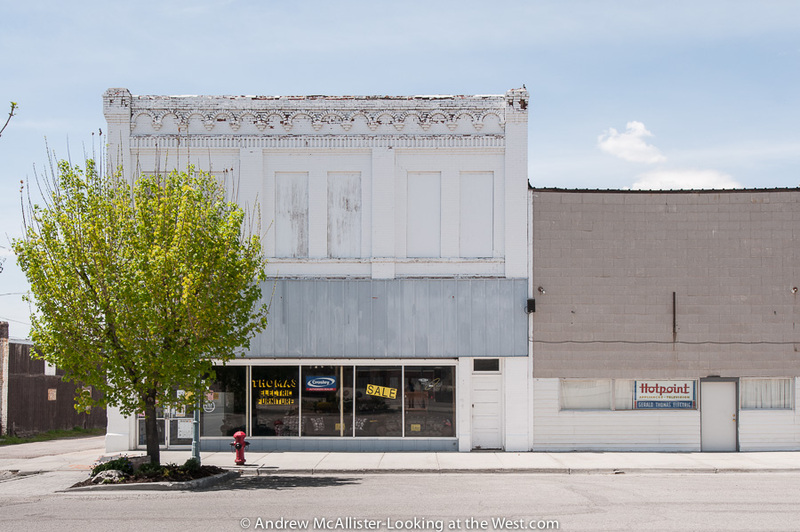 My visits to Malad City Idaho so far have been for two different projects. 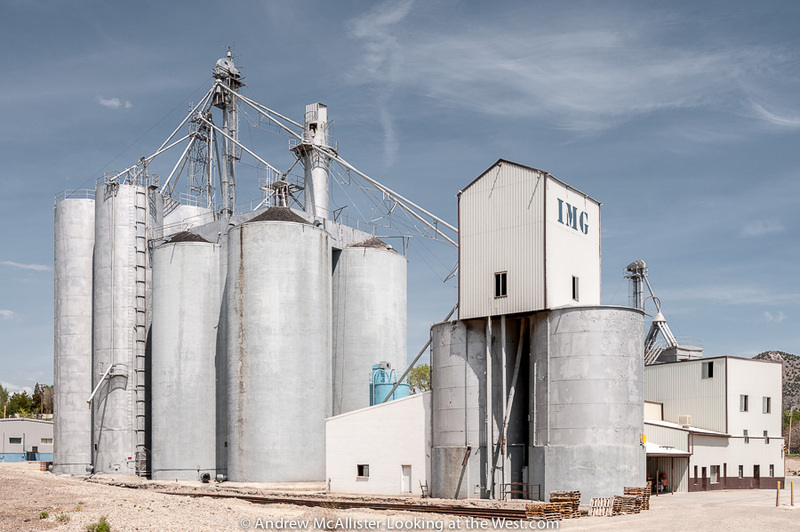 The first is my exploration of commercial blocks in small towns the second is a more focused project documenting grain silos in the area as the exist in 2013. Above: Profile view of grain silo’s in Malad, Idaho. 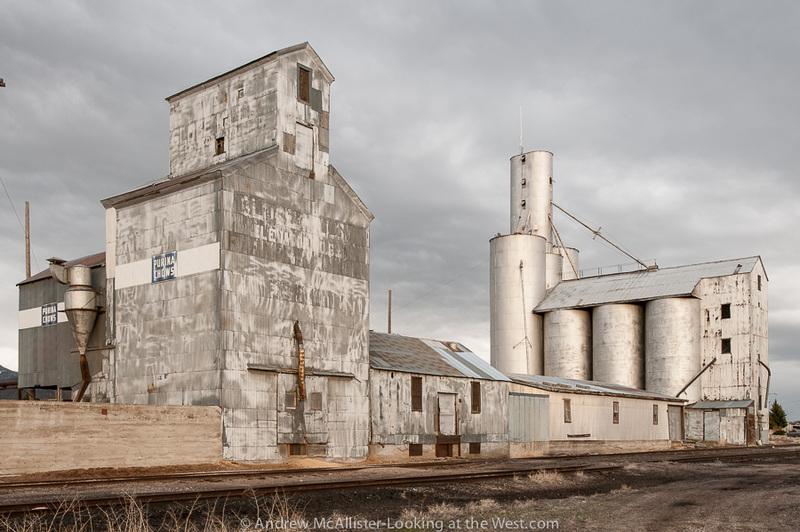 Above: Silo structures in Malad City, Idaho. The square silo building in the foreground is a wooden structure clad in tin. If you look closely you can read that at one time it was a part of General Mills. The tin siding takes a beating in the wind and a large section has been recently replaced. Notice the letter “M” on the hillside. A very small skunk crossed the road while I was photographing the scene above. Though not visible in this frame it was fun to watch. 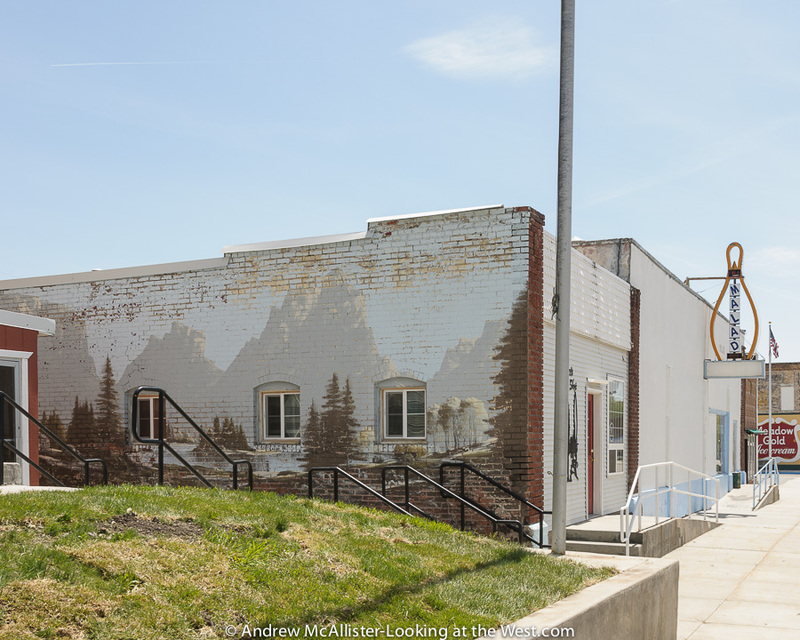 In my exploration of small western towns I have taken notice of these really cool western murals. Many are fading badly and I hope someone out there is keeping the tradition alive. I love it when I find buildings like these. The Thomas Electric Furniture building looks majestic compared to the Hotpoint building. When I see building like the one on the left I can only wonder what they were like when they were first built. All those windows on the top floor must have let in so much light. Was it storage, a workshop a residence? If I am there on a day they are open I’ll have to ask. Department Store in Malad City. 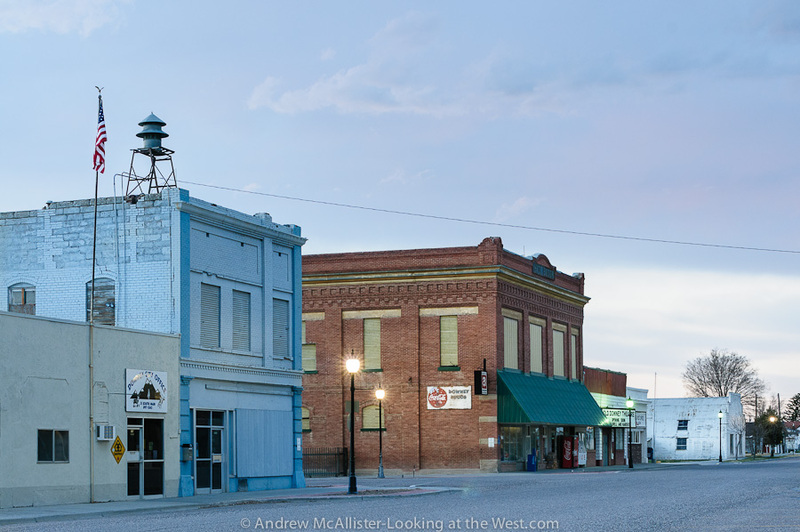 This is an interesting grouping of buildings. The building on the left is actually a wedge shape on the intersection. the building that says CO-OP BLOCK actually wraps around it with entrances on two different streets. Though now all connected notice the 3 different window dimensions. Also notice that when the original windows were replaced they used off the shelf solutions instead of keeping the curved top window. Lastly notice the faces at the top and the ornamental metalwork and the photographer (me) reflected in the window by the door. Lots of interesting (and gross) things can be found by walking a towns alleys. In Malad City I was fascinated by this small red building behind what was a ZCMI building. 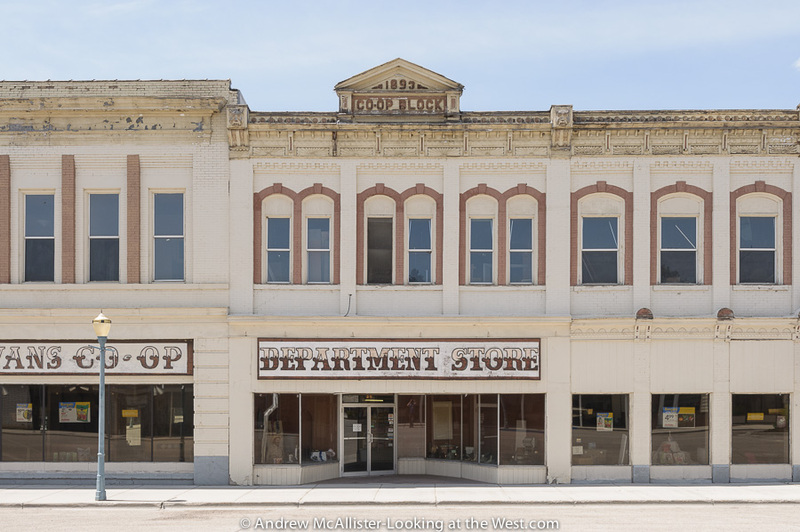 A classic low-road building that I am amazed is still standing. Lastly another silo structure with a few features I am wondering about. The tanks have a coating or insulation that I have not seen on other silos and the head house on the two silos on the right is unlike ones I have seen before. Notice the letter “M” on the hillside on the right. 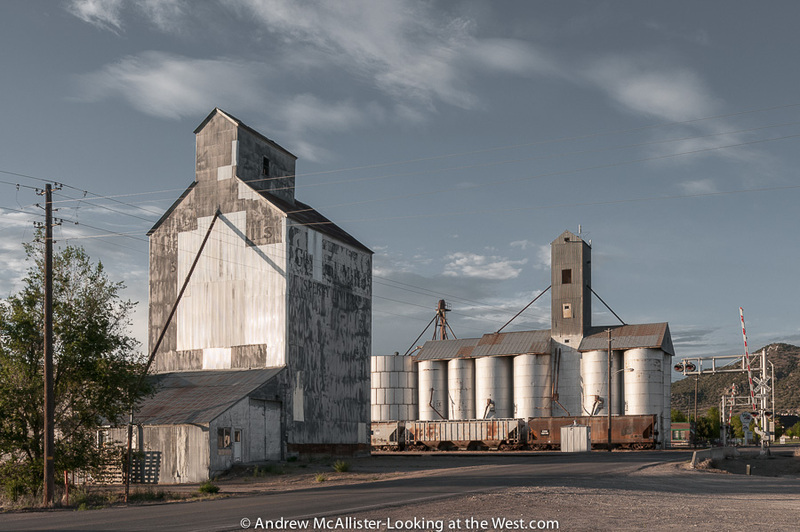 This past winter I started looking at grain silo’s, mills and other structures associated with industrial agriculture in Northern Utah and Southern Idaho with the idea of creating a photographic survey. 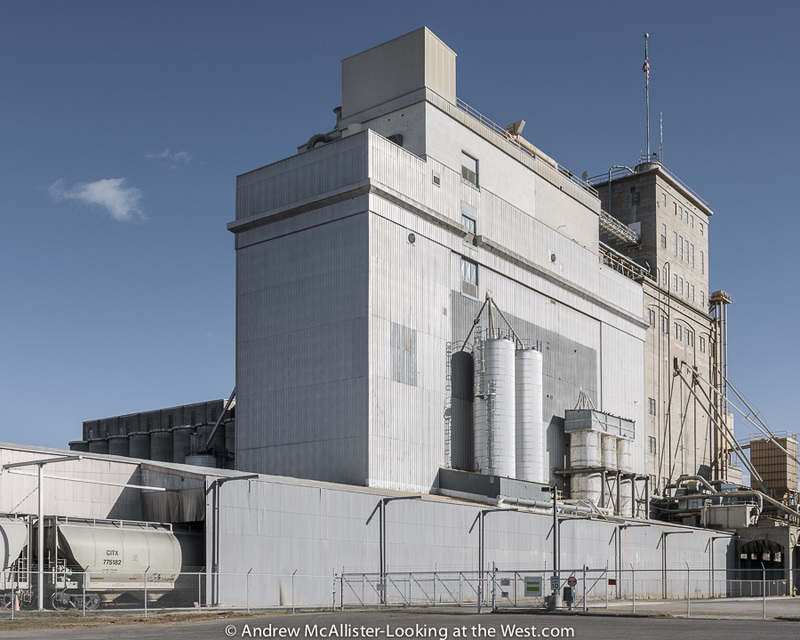 Above: Horizon Milling facility, Ogden Utah 2013. 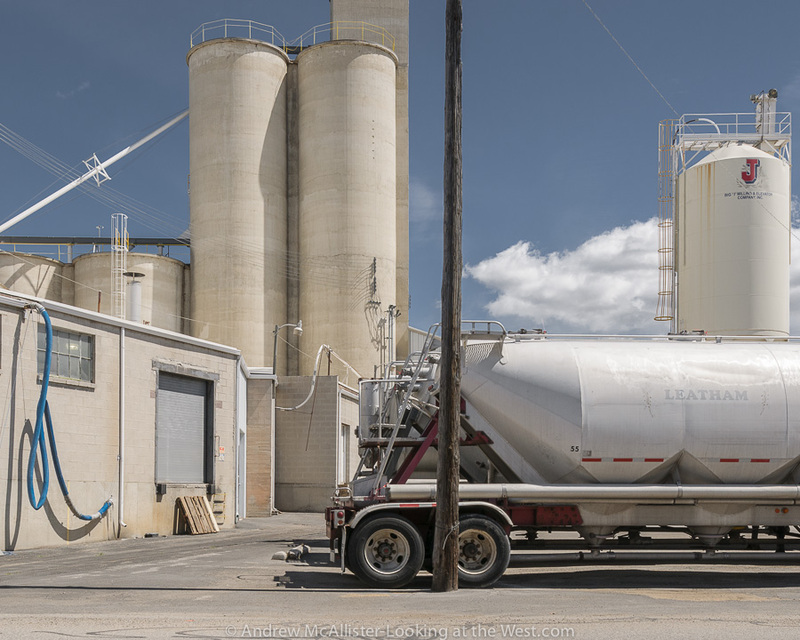 Above: Cache Commodities, Ogden Utah 2013 Check out the piping and sorting units. Anyone with information about various parts of these facilities please comment. 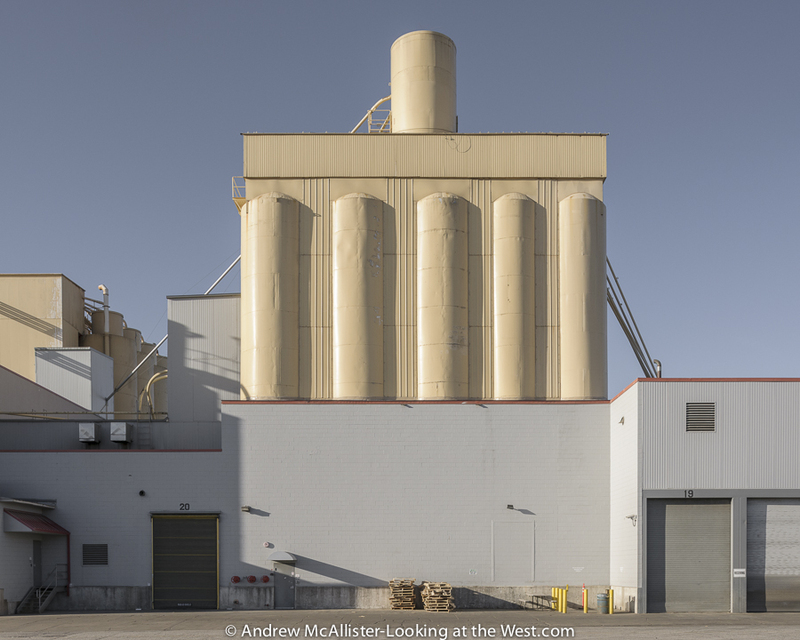 Above: Abandoned slip formed silo’s near Wasatch Laboratories in downtown Ogden, Utah 2013. When visiting these type of sites make sure to respect fences and no trespassing signs. 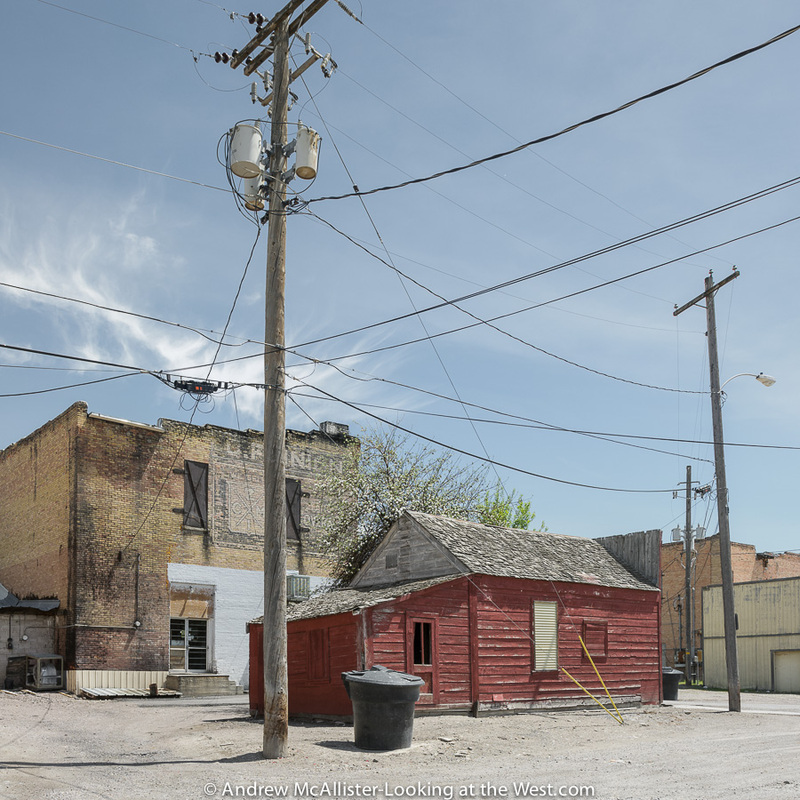 I look at it as an additional challenge to photograph from roads and public access ways. 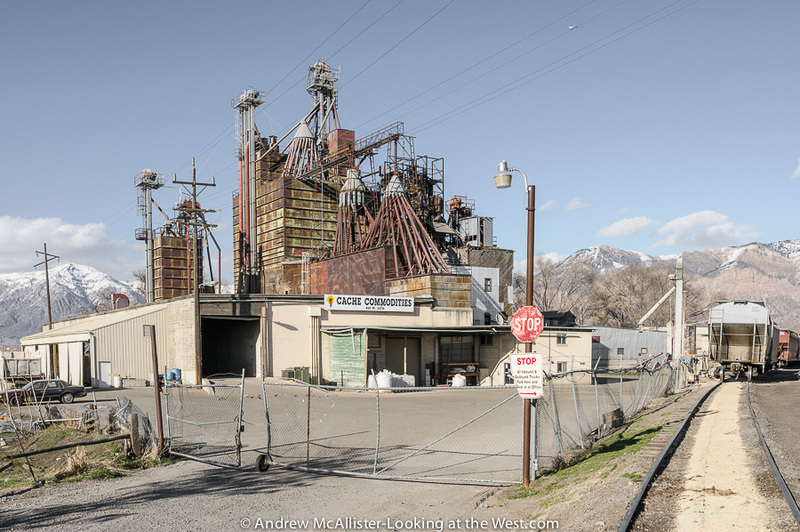 Above: American Nutrition, Ogden, Utah 2013. Love how the late afternoon sun creates those hard lined shadows. On my last trip to Downey I was at the tail end of a 3 day weather system that came across Northern Utah and Southern Idaho. 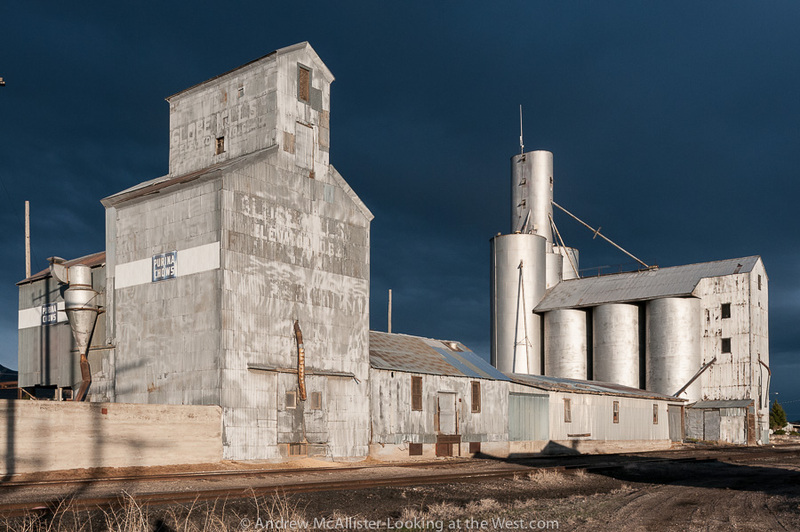 As I was photographing the grain elevators in Downey I got the dramatic light I was hoping for. Over the span of a few minutes the light went from a cool overcast grey to super dramatic. I like both images however at some point I will have to decide which one to keep as the portfolio image. I would like to ask followers of Looking at the West which version of the scene they prefer and why. 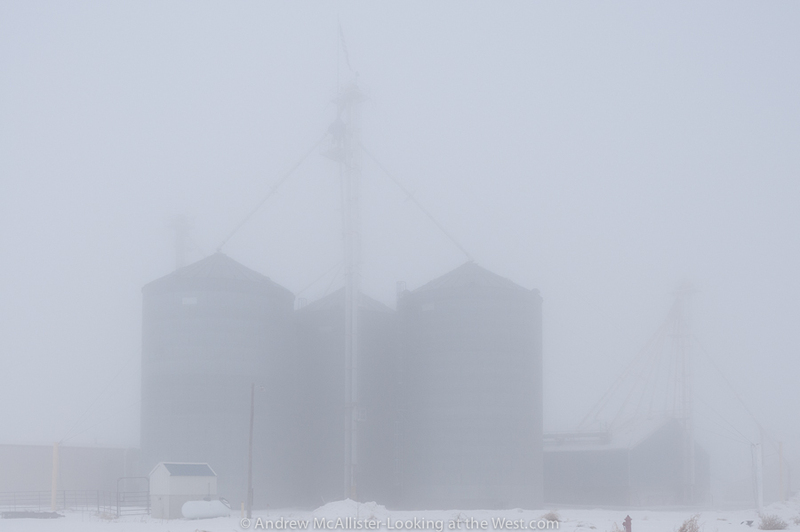 Above: Grain Silos near Lewiston, Utah on a grey foggy January afternoon in Northern Utah. Depending on the screen you view this on you can see quite a bit. 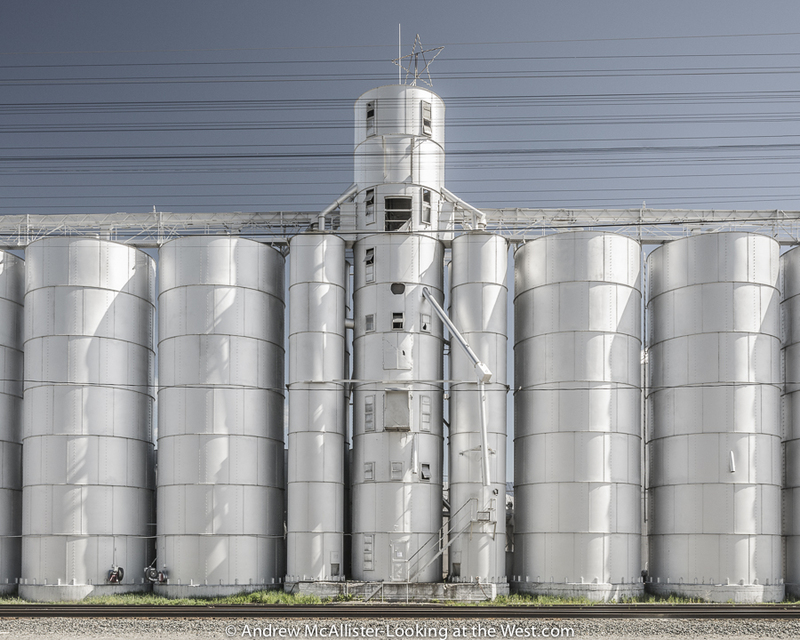 I’m amazed I was able to get sharp focus on the silos. Could be the start of a series of posts on agriculture architecture. There certainly is a lot around the area. 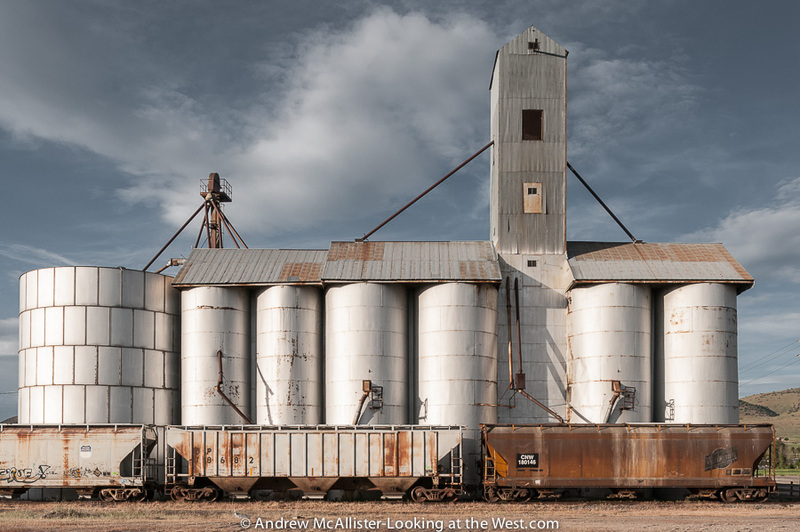 Does anyone know the difference (if any) between a silo, grain silo and a grain elevator?